What Would St. Thomas More Think of the Kasper Proposal? You are at:Home»Learn & Live the Faith»Apologetics»What Would St. Thomas More Think of the Kasper Proposal? One of the towering figures of the turbulent period which culminated in the creation of the Church of England was St. Thomas More. He was born in 1478, just before the Protestant schism began in Europe, and was a prominent British lawyer and statesman who became a trusted adviser to King Henry VIII. As a British citizen, St. Thomas More’s loyalty to the King was tested when King Henry VIII sought an annulment for his marriage to Catherine of Aragon. Henry had become infatuated with his mistress, Anne Boleyn, and frustrated with Catherine’s failure to produce a male heir since their sons had died in infancy. In order to marry Anne, Henry sought an annulment from Pope Clement VII, who refused to grant it and upheld the marriage as validly contracted. The Church of England, separated from the Catholic Church, was created by Henry in 1534 so that he would be able to obtain an annulment and marry Anne. Now, what does this great martyr have to do with the Kasper proposal? The Kasper proposal relates to the many Catholics today who are genuinely striving to live a Christian life while in a situation of divorce and civil remarriage, without an annulment of their prior marriage. According to Church teaching, as long as their first marriage has not been annulled, this would be considered adultery (Luke 16:18) and would thus prevent them from being able to receive the Eucharist. Cardinal Walter Kasper has proposed that the Catholic Church could, as a merciful pastoral accomodation, permit giving Holy Communion to these Catholics after a period of penance. This was a key debate at the recent Extraordinary Synod on the Family held in October and will be addressed once again at the upcoming Ordinary Synod in October 2015. It is fair to ask what St. Thomas More would think about this proposal. Imagine if the Kasper proposal had been in place during the reign of King Henry VIII: The King could have obtained a civil divorce of Catherine and then a civil marriage with Anne, just as he did, although with much less drama. Then, as a divorced and civilly remarried man, he could have maintained full communion with the Catholic Church and received Holy Communion. There would have been no need for a schism from Rome and England would have remained Catholic! 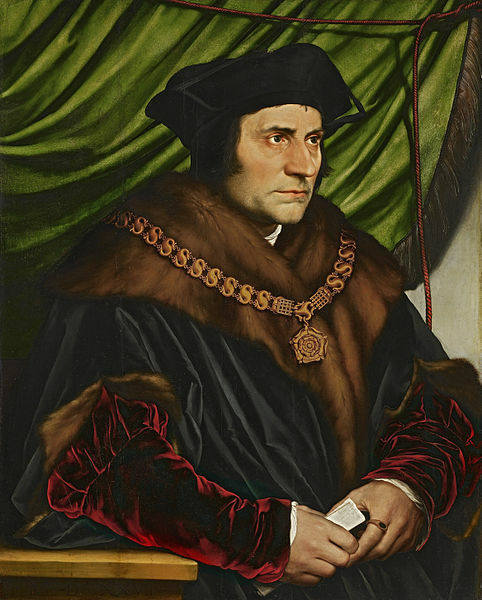 St. Thomas More may have lived to old age, died a peaceful death and never have been declared a saint at all. So, did he actually die in vain? This can be a “hard saying” (John 6:60) but the Church has always held to the indissolubility of marriage, as well as the authority and integrity of Church teaching. The divorced and remarried always deserve compassion and are welcome in a parish community, but offering the Eucharist to Catholics who are living in a marriage relationship with someone other than the valid spouse recognized by the Church would open up an inconsistency in Church teaching. Would this mean that the situation is not adultery, that adultery is not a mortal sin, or that mortal sin is not an impediment to receiving the Eucharist? Certainly regular adulterers, who have a Catholic marriage and continually carry on with an affair, cannot be denied the Eucharist since they are in the equivalent moral situation, from the perspective of the Church. However, if they were to be denied while persisting in their illicit relationship, they would still have an obvious pathway forward to reciving communion: a civil divorce of their valid Catholic spouse and a civil marriage to a mistress would be a fix. This would put the Church in the awkward position of implicitly encouraging divorce as a solution for a person who refuses to stop an affair. Polygamous marriages, a fairly common pastoral issue for new converts in Africa, would then be no hindrance to communion either since it could be said that this is merely the simultaneous form of a similar arrangement. The questions keep coming. 1664 Unity, indissolubility, and openness to fertility are essential to marriage. Polygamy is incompatible with the unity of marriage; divorce separates what God has joined together; the refusal of fertility turns married life away from its “supreme gift,” the child (GS 50 §1). St. Thomas More is a clear voice from Catholic history crying out against the Kasper proposal. Many cardinals and bishops are fulfilling this important role today. They have even recently released a book to explain Church teaching on this topic called Remaining In The Truth of Christ. The integrity and authority of Church teaching would be compromised by the Kasper proposal. Even such a seemingly small change risks undermining the Church’s claims to teaching authority from Christ. The teachings of Christ’s Church cannot change, just as God does not change (Malachi 3:6). If Church teachings can change, and the Catechism can be revised at any time, then we are not far from being a bunch of Protestants with a Pope. That is not what St. Thomas More died for. He died in full loyalty to Christ’s Holy Catholic Church, which is not tossed around by every new wind of teaching (Ephesians 4:14) but instead serves as the “pillar and ground of truth.’ (1 Timothy 3:15). Amen! St. Thomas More, pray for us! A related issue to the marriage question is the children involved in these situations. My parents divorced when I was ten and both have remarried. My father had custody of us children and he remarried civilly, actually in a Protestant church, before getting a decree of nullity and then having his new marriage convalidated. My stepmother did the same. She married my father and then got her annulment afterward. I am the only child from the combined family who is a practicing Catholic. I think their civil/Protestant marriage sent a strong message to the family about the sobriety and validity of Catholic teaching. All of my siblings and step-siblings have rejected the Church. Children in divorce/remarriage situations deserve every consideration. Remarriage, whether or not it involves an annulment, creates an incongruity in their families that is never resolved. I believe in the possibility of benevolent stepparents who become emotional surrogate parents, but it’s definitely not the case for me or for anyone I know. The indissolubility of marriage is of paramount importance in the Church today. The children involved deserve just as much consideration as the adults. Moreover, the children deserve protection. Cardinal Kaspar, for all his misplaced sympathy, is not merciful toward the children.